Originally constructed as the Convent of the Immaculate Conception, Quinta Real Puebla is a magnificent 16th century hotel situated in the historic center of Puebla, a city declared a World Heritage Site in 1987. Built in an extravagant Spanish Colonial style, Quinta Real Puebla is teeming with vibrant courtyards, decadent guestrooms, and warm Mexican hospitality. 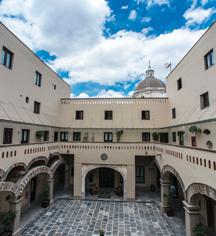 The property boasts religious and architectural details unique to the era of the Spanish settlement and remains passionate about celebrating and preserving the heritage of Puebla. Quinta Real Puebla, a charter member of Historic Hotels Worldwide since 2013, dates back to 1593. The Convent of the Immaculate Conception became a landmark in the Battle of Puebla on May 5, 1862. Accessible Rooms: Accessible rooms are available, hotel does not have elevators. Please notify request at time of booking. Deposit: Credit card deposit is required at time of check-in. Hotel/Resort Fees & Taxes: Additional taxes or fees may apply. Parking: On-site parking is not available. 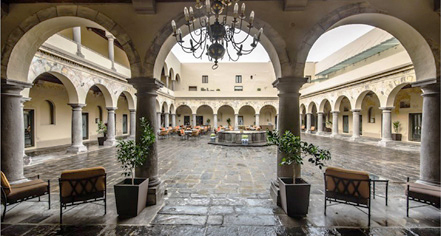 Originally constructed as the Convent of the Immaculate Conception, Quinta Real Puebla is a magnificent 16th century hotel situated in the historic center of Puebla, a city declared a World Heritage Site in 1987. Learn more about the History of Quinta Real Puebla .